The fluvial ecosystem integrates the biota and biological interactions with all of the interacting physical and chemical processes that collectively determine how systems function. Certain properties can be recognized that characterize the whole system: its overall production and metabolism, how efficiently nutrients are used, the diversity of energy supplies, and the number of species and feeding roles represented. 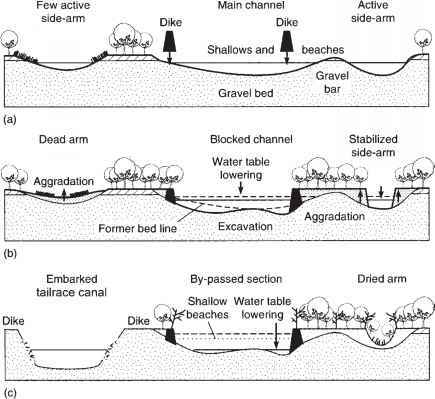 All ecosystems have some flux across their boundaries, but fluvial ecosystems are especially open, exhibiting high connectivity longitudinally, later ally, and vertically (Figure 1.1). Ecosystems include people, and rivers have always been magnets for human settlement, providing water for drinking and to grow crops, harvestable resources, transportation, and hydropower. In ways both subtle and obvious, almost all running waters today show some evidence of modification due to human activities. In fluvial food webs, all energy available to consumers ultimately originates as primary production, but not necessarily from aquatic plants or within the stream itself. The primary producers of greatest significance, especially in small streams, include algae, diatoms, and other microscopic producers. These are found on stones, wood, and other surfaces and occur where light, nutrients, and other conditions are suitable for their growth. Organic matter that enters the stream from the surrounding land, such as leaf fall and other plant and animal detritus, is an important energy source in most streams, and is of primary importance in many. Bacteria and fungi are the immediate consumers of organic substrates and in doing so create a microbe-rich and nutritious food supply for consumers, including biofilms on both inorganic and organic surfaces, and autumn-shed leaves riddled with fungal mycelia. Rivers typically receive organic matter from upstream and also laterally, depending upon the nature of the riparian vegetation and the river's connectivity with a floodplain. In forested headwater streams and large floodplain rivers, most energy is received as external inputs, termed allochthonous sources. Streams flowing over a stony bottom in an open meadow often develop a rich algal turf on the substrate, and so most of the energy is produced internally, that is, from an autochthonous source. Typically, the food webs of streams and rivers are fueled by a complex mixture of allochthonous and autochthonous energy sources, and unraveling their relative contributions to higher trophic levels is a considerable challenge. shed leaves enriched with microbes; predators consume other animals; and collector-gatherers feed on the abundant and amorphous fine organic particles originating from the breakdown of leaves and everything once living. Because functional feeding groups place primary emphasis on how the food is obtained rather than from where it originated, they may imply greater distinctiveness in trophic pathways than actually is the case. This is especially true in the case of biofilms, which appear to be ubiquitous and likely make a direct contribution to the trophic needs of all consumers. The biological communities of fluvial ecosystems are assembled from the organisms that are adapted to regional conditions, including the physical environment and food resources, and are further refined through interactions with other species. Similar to the way that large-scale aspects of climate, vegetation, and geology influence local-scale physical and chemical features of the stream environment, a series of hierarchically nested environmental factors also influences the assemblage of species at progressively more localized spatial scales (Figure 1.5). Species able to colonize and survive within a particular stream network are those that occur within the region and are tolerant of the hydro-logic and thermal regimes and water chemistry. Persistence at the valley reach level requires a more refined match of species adaptations to physical habitat, food resources, and specific temperature and flow conditions. 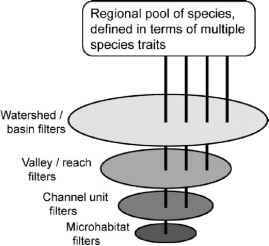 Additional filters at the channel unit and microhabitat level further restrict the pool of suitable species to those with traits suited to finer-scale conditions such as space within the interstices of the substrate, local hydraulic conditions, and habitat and food resources. Lastly, interactions among species can serve as a powerful additional filter, as when one species competitively displaces another, a critical food resource is lacking, or a top predator eliminates all but the most cryptic or elusive of prey. The river ecosystem includes its hydrology, diversity of channel and habitat types, solutes and sediments, and biota. Certain processes and properties emerge at the level of the whole ecosystem, including the flow of energy through food webs, the cycling of carbon (C) and nutrients such as nitrogen (N) and phosphorus (P), and the origin, processing, and transport of materials from headwaters to sea. Rivers are not only important links in the hydrologic cycle and "the gutters down which run the ruins of continents'' (Leopold et al. 1964), but also ecosystems that use and reuse biologically reactive elements. In any ecosystem, nutrient cycling describes the uptake of some nutrient, usually from a dissolved inorganic phase, and its subsequent incorporation into biological tissue. That material resides for some time in organic form within the plant or microbe, and likely passes through other consumers, but eventually is remineralized by excretion or respiration, thus completing the cycle (Figure 1.6). In running waters, downstream transport occurs in both the inorganic and organic phases, but especially in the former, stretching the cycle into a spiral. Thus, uptake distance rather than time becomes a useful measure of biological availability and demand.